This study concerns the management of an interactive whiteboard (IWB) network started in April 2008 in Mpumalanga, with a leading school partnered with several disadvantaged schools, transmitting lessons in Mathematics and Science. Many educational institutions try to provide learners with better learning opportunities by equipping schools with the latest technology. The IWBs have been invested in the most and the project is very successful in bridging the urban-rural divide. Information Communication Technologies (ICTs) play an important role in reforming education. This study concentrated on the key managerial challenges to leaders when faced with introducing, accepting and managing new technology in their schools. The purpose of the study was to describe the management approach that developed during the implementation of the IWB network and what possible contribution the lessons learnt from this case study could have on management theory regarding the management of ICTs in similar multi-school models. Technology integration is the effective use of technology inside the classroom to better facilitate learning and prepare learners of all societies for the digital era. Because of the potential power of ICT, its possibilities and application in education have been widely researched and, as new possibilities emerge, the boundaries of traditional teaching and learning are constantly being moved (Imison & Taylor, 2001). Information Communication Technologies (ICTs) have become so highly valued in many societies that they dictate the way we communicate, socialise, organise, plan, interact, behave, work and live. They affect all spheres of our lives, and have become indispensable tools to function in modern society in a globalised world (Anderson, 2010). The on-going infusion of ICTs in schools, driven by the belief that ICTs can play an important part in reforming education and advancing educational goals, has placed pressure on school management teams in many countries to address reform and make ICT a priority in schools (Wong, Li, Choi & Lee, 2008). In 2005, a well-resourced school bought two IWBs and a technology teacher started experimenting with the use of one in his class. He could connect using the technology to his friend in England, and thought that if this could be done, it should also be possible to link up with other schools in the region. The internet connectivity to do that, however, did not exist. The speculation was that, if this could be put in place, the knowledge and skills available in one school could be shared with other schools, thus benefitting the whole area. His school took a decision to develop an ICT learning environment that would link their own school with schools in disadvantaged areas. As a concept, it was unique to schools in South Africa. Realising the potential that such an initiative has, different sponsors came on board and provided funds. In April 2008, an interactive ICT-network was started, implementing smart boards (interactive whiteboards), with the leading school and three previously disadvantaged schools as partners. The main purpose was to reach out to rural schools in the area in order to improve the teaching of Science and Mathematics for Grade 12 learners. Later, two schools were added to the network. These five schools are connected to a central file server that is situated at the leading school. This file server contains all the Mathematics and Science resource materials, such as lesson presentations, common tests and exams, recorded video lessons, as well as lesson notes for the remote teachers and students. The lesson notes are printed the day before the actual transmission, and then handed out on the day of the lesson. During each session, the presenter records the lesson and it is saved on the file server for the purpose of revision, or it can be downloaded on a memory stick for the students to take home. The authors were part of the initial research conducted on the leading school's e-learning network and gained a keen interest in the project as the learners, teachers and the management members were very positive about it. From the outset, we were intrigued by the management challenges that required an approach that would deviate from the traditional line function approach. Each school retained its own management and governance structures, but was required to create the possibility of managing the ICT network across traditional boundaries. Because the project had survived numerous setbacks, it offered an excellent opportunity to study the management challenges faced and solutions found. The purpose of the research was to determine the key managerial challenges in implementing an ICT network at a cluster of schools. We also wanted to determine the managerial approach that was adopted in the network, and discover the possible contribution that the lessons learnt from the case study could have on management theory regarding the management of ICT in similar multi-school models. Many educational institutions worldwide try to provide students with better learning opportunities, by equipping schools with the latest technology. This encourages teachers to use technologies such as computers and the internet, and this process is referred to as the integration of ICT. As part of the ICT integration process, the interactive whiteboard has been the most invested in, especially by European countries (Türel & Johnson, 2012). Amongst the benefits of using IWBs noted by teachers are the efficiency, flexibility and versatility, the opportunities to access countless multimedia sources and the ability to switch seamlessly between normal board work, video, other programmes and the internet using the pen, computer mouse and on-screen icons, as well as their ability to manage the class more easily while using the IWB (Glover & Miller, 2001). Many teachers use whiteboards to appeal to multiple senses and learning styles, just as they use a variety of resources to suit different needs (National Centre for Technology in Education (NCTE), 2008). Effective use of an IWB also encompasses a wide range of teaching styles like teacher modelling, prompting, promoting questioning, managing class discussions, review of work in progress and whole class evaluation (British Educational Communications and Technology Agency (Becta), 2004). The IWB gives learners the confidence to take part in lessons and they find it easier to express themselves using the whiteboard (Smart Technologies Inc., 2008). Even though the advantages seem to be numerous, there are certain drawbacks that one needs to consider. Given the cost per IWB package, schools need to give serious consideration to the possible alternatives. Only if the IWBs are used to extend and transform learning can their cost be justified relative to cheaper solutions (Becta, 2004). Teacher professional development is crucial. Teachers cannot be left alone to experiment on their own after the initial hardware training. They need training in the most effective approaches to take advantage of the technology (NCTE, 2008). Becta (2004) finds the developing of multimedia teaching materials to be a significant addition to workload in the early stages and the expectations that the whiteboard engender in learners puts pressure on teachers to constantly improve the presentation and content of lessons. Leadership and management go hand in hand. The manager's job is to plan, organise and coordinate; the leader must inspire and motivate. Management is a set of well-known processes that keep an organisation going, like planning, budgeting, staffing, problem solving and measuring performance (Kotter, 2013). Management helps you to produce products and services on budget, day after day, week after week. Leadership is associated with an organisation's future, finding and exploiting opportunities. Leadership is about vision and aligning people to that vision. It means buy-in, communication, motivation and inspiration and producing useful change (Kotter, 2013). The importance of effective management in educational organisations is becoming increasingly recognised. Schools arelikely to be much more effective if they are well managed. Today, schools are taking responsibility for many functions that were previously undertaken by national or regional government, like financial and staff management. Now that educational institutions have this responsibility, it is possible for leaders to adopt a strategic approach, integrating different aspects of management to achieve goals (Bush & Coleman, 2000). Management is not confined to the principal; however, strategic management is usually exercised by the principal working with the school governing body (SGB). Matrix management is a "mixed" organisational form in which normal hierarchy is overlaid by some form of lateral authority. In a matrix, there are two chains of command, one along functional and the other along project lines (Larson & Gobeli, 1987). Edgell (n.d.) describes the matrix as a rectangular arrangement of elements into rows and columns, the horizontal and vertical, intersecting into a grid or network of interfaces. A matrix interface is the focus of authority and responsibility, determining who works with whom on a project. 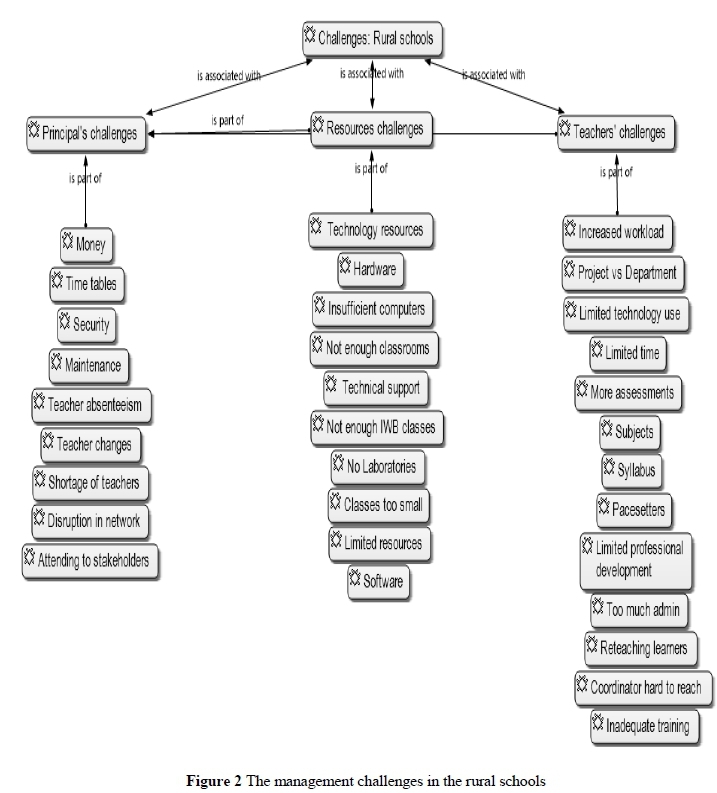 It is not just technology that constitutes the rationale of a matrix organisation, but the need to respond to two sets of complex and dynamic environmental conditions, one of which may be technological change, as is the case in this project (Bresnen, 1990). Whereas this study looks at the management of a project that involves a number of schools, each with its own management structure, matrix management seems to be the most relevant theoretical lens to use to study the management challenges faced by the project and the schools. There are different types of matrices. In a balanced matrix, where the project manager is responsible for defining what has to be accomplished and when, while functional managers are concerned with how it will be accomplished. In a balanced matrix, a person is assigned to oversee the project and interacts on an equal basis with functional managers (Larson & Gobeli, 1987). Employees are officially members of two organising dimensions and the balanced matrix strives for equalized power and authority between organising dimensions (Sy & D'Annunzio, 2005). The balanced matrix is most appropriate for dynamic, diverse, event-driven, distributed and technically complex activities. In the leading school, a balanced matrix developed, as depicted in Figure 1. The role of the SGB in a matrix organisation A governing body is elected or appointed to govern a school. The members represent the school and community. Its main objective is to promote the welfare of its school. School governing bodies (SGBs) determine the policies and rules for organising, managing and controlling of the school affairs. School governing bodies (SGBs) are responsible for school governance which has to do with the creation of policies and rules for the staff, learners and parents, and making decisions about how the school will be run. School management has to do with the actual day-to-day running of the school. The principal along with the School Management Team (SMT) is responsible for school management (Equal Education, 2011). The role of the school management team (SMT) The SMT consists of the principal, deputy principal and Head of Departments (HODs). The SMT was put in place to ensure that the school culture is dynamic and supportive of an effective teaching and learning culture (Ndou, 2008). The SMT's functions range from planning and budgeting to organising and staffing, implementing policy, controlling discipline, problem solving, monitoring and evaluating plans and motivating staff. According to Kolodny (1979) a successful matrix organisation is always led by a Chief Executive Officer (principal) who understands how to make it work. The formal role of the general manager is similar to the top management role in a traditional organisation, in that it includes total responsibility for those activities subordinate to the position (Kolodny, 1979). The general manager is above and outside the basic matrix structure, and therefore has a clear perspective of all activities and staff within the matrix (Adams & Kirchof, 1984). A paradox of the matrix is that it requires a strong, unified command at the top to ensure a balance of power at the next levels (Lawrence, Kolodny & Davis, 1979). Functional and project leaders in the matrix The roles of the functional and project managers in a matrix exist on the same level, both reporting to the general manager (principal), where they must act on a cooperative basis if the matrix is to succeed. Both maintain some degree of authority, responsibility and accountability with regard to the organisation's projects. This means that they must negotiate continuously, and both must be committed to managing in a professional and productive manner the conflict that will inevitably develop (Adams & Kirchof, 1984). The project-functional interface is the state of divided loyalties individuals face when they are required to answer to two bosses. Functional managers sometimes experience the matrix as a loss of status, authority and control, because most major decisions are shared with other managers at either the same or a higher level (Adams & Kirchof, 1984). Projects are horizontal in nature, because they need a composition of expertise from across the functional units to complete their objectives. Functional departments are vertical entities. At a school level, the HODs will fulfil the role of functional managers. The project manager is responsible for a clear project plan to reach performance targets, determine resource budgets, manage project risks, sustain a focused and committed team, create the team's operating practices, monitor performance against plans, resolve priority or interpersonal conflicts, as well as project issues and problems, control project changes, accomplish objectives within time and budget constraints, and contribute to team member's appraisals (Hendrickson & Au, 2008). Project managers represent top management on assigned projects. In carrying out their responsibilities, they work across traditional functional lines to bring together an organisational focus, so that the project objectives can be achieved. Qualitative Descriptive Case Study Approach The research was designed as a qualitative, descriptive case study, using open-ended interviews, field notes and documents as data gathering techniques. Nieuwenhuis (2007:51) describe qualitative research as research that studies people or systems by interacting with, and observing them, in their natural environment, with the intention of describing and understanding the phenomena by "looking through the eyes" of the participants, so that their meaning can be described in terms of the meaning that they have for the participants. The emphasis is on the quality and depth of information (Nieuwenhuis, 2007). The natural environment of the participants consisted of the different schools we visited. These schools ranged from a richly resourced school in an Mpumalanga town, to a farm school in the rural area, with the distances between them ranging from 10 to 50 kilometres. We were looking through the eyes of the participants at the challenges in the project. One of the goals of a qualitative study is description. Good description is fundamental to the research enterprise (Hale, 2011). Descriptive research is restricted to factual registration and there is no quest for explanation as to why reality is showing itself in a particular way. The primary aim of the research was to provide an in-depth description of the management challenges the participants had to face, as well as the management approach that developed in different schools. The intervention in a few Mpumalanga schools established the whole project as a case, with a small geographical area and a small number of individuals chosen. Yin (2009) defines the case study research method as an empirical inquiry that investigates a contemporary phenomenon when the boundaries between phenomenon and context are : not clearly evident; not under the investigator's control or influence; and in which multiple sources of evidence are used. These boundaries should be clarified as part of the case study (Yin, 2009). The IWB network in the rural schools is a contemporary phenomenon. This is a single case study design, an example of school innovations in which individual schools adopted the IWB network. Generalisation was not the intent of this study, but peoples' practical experiences were described. The Mpumalanga project consists of six schools in an IWB network. The schools constitute the sample, but each has its own set of individual characteristics. In each school, a member of the SGB, the school principal, the project leader (if the school employed one), HODs and staff members participating in the project were interviewed. The administrative officer of the leading school and a representative of the Mpumalanga Department of Education (DoE) were also interviewed. Each of the selected participants had a role to play that made their inclusion apposite. Data collection in qualitative descriptive studies is directed towards discovering the who, what and where of events or experiences (Sandelowski, 2000). Semi-structured interviews were held with the participants and this was used as the primary strategy for data collection (Hoepft, 1997). Questions were asked from an interview guide, designed prior to the interview. Although the research questions were set a priori, the study was entered into in an emergent way, with an open-ended or natural attitude (Lincoln & Guba, 1985). The purpose of the interviewing was to gain access to the other person' s perspective. Although there were strong similarities in the questions asked across participants, there was also flexibility in questioning to allow each participant some control over deciding what aspects of the phenomenon are most important from their experience (Shah & Corley, 2006). As new ideas emerged, they were pursued further until data saturation was achieved (Creswell, 2009). In the interview guide, we asked questions about the management and reporting lines, managerial challenges, the management roles and influence of the different role-players in the project, supervision and monitoring of teachers, the contribution of the project to the specific school, possible disruptions or problems as a result of the project, opportunities for professional growth and other teaching benefits, the motivation of the teachers and learners, the mission and vision of the schools, possible advice to other schools, and the future of the project. Another invaluable source of information for qualitative researchers is document analysis (Hoepft, 1997). It is the systematic exploration of written documents or other artefacts. Such data for this network included a Strengths, Weaknesses, Opportunities and Threats (SWOT) analysis of the early days of the project, where challenges were identified similar to those coming to the fore in the interviews. A transformation agenda was drawn up by the South African Teacher's Union in Mpumalanga. The goals of the transformation are to close the achievement gap between advantaged and disadvantaged schools and to better the quality, quantity and choices in education, to modernise the education, digitise the classroom, and focus on teaching and learning. This project is an excellent example of what can be expected of transformation in the area. In a document focusing on "ways of learning", of the Mpumalanga Department of Education, Maritz (2011) has noted that the importance of professional development of educators is widely recognised. Training is narrowly seen as including activities delivered by providers. Another way of learning is assessment by a critical friend, where feedback is received after observation (Maritz, 2011). In the subject groups in this project, such feedback took place. This can also be seen as mentoring a less experienced colleague. Regular opportunities are provided for discussions of goals, sharing of ideas on effective practice and reflection on current practice. Educators are also often brought together to discuss a curriculum, design a programme, solve a problem or plan strategies to solve a particular problem (Maritz, 2011). These discussions also took place in the subject groups in the project. The most important goal, or biggest challenge of this project, is to receive better results. The documents obtained in the research included the results of schools, some from 2008 and others from 2010, against which it was possible to compare more recent performance. In 2013, one of the rural schools obtained a 100% Grade 12 pass rate, another 90% and yet another, 85.7 percent. One of the schools, in 2008, had only four learners passing with admission to a Bachelors degree, but, in 2013, they had twenty-eight. Although every year is different, it is clear that this project is already showing signs of bridging the urban-rural digital divide. As a result, many learners obtained bursaries for further study. Document analysis enabled the researchers to sift through a large amount of data with comparative ease in a systematic fashion. It was used in conjunction with the interviews to develop a better understanding of the phenomenon of interest and the context in which the phenomenon is occurring (Shah & Corley, 2006). Field notes were made to capture feelings and observations during the interviews. The field notes were transcribed into summaries. Semi-structured interviews, field notes and document analysis were used to triangulate the data to enhance the credibility of the study. Data analysis in qualitative research does not use preexisting codes for sorting data, but it always has a focus, driven by the research questions. Data in this study came in the form of notes and tape recordings. We recorded all the interviews and transcribed them verbatim. The entire data set was read several times to obtain a complete picture of the project, as seen through the eyes of the participants. Obvious redundancies and repetitions were omitted. Thereafter, the data was divided into meaning units, segments of data, communicating sufficient information to be understood and meaningful even if read out of context (Elliott & Timulak, 2005). Atlas.ti was used for the analysis of the data. All the transcribed interviews were imported into Atlas.ti and we marked all the recurring ideas. Through open coding a lot of codes were created, under subtitles like 'positive changes', 'goals', 'challenges', and 'roles'. As each code is created, the program uses it to detect the relevant content in the interviews, which is then tagged with the code name. In this way, it is easy to find what different participants said on different topics, and to copy and paste that portion of the interview in the data analysis. A printout of all the codes was created to calculate the number of times each code occurred and to establish which codes were most important. Then code families were created, putting the codes belonging together under the same subheadings. After this, networks were created, for example, ' management changes' and 'management challenges' . The Key Management Challenges in the Project In Figure 2, the management challenges in the rural schools are depicted. The principals' main headache is money, chiefly for things like security and maintenance. The sponsor money is mostly used for new smart boards and maintenance. In the rural schools, the school fees are very low, and school budgets, controlled by the principal and SGB, are used for buying more IWBs, security, insurance, upgrades and paper. In some schools, there is a shortage of teachers, while others experience problems with teacher absenteeism and teacher changes as a result of teachers leaving. New teachers have to be retrained, and that training maybe perceived as inadequate. Any disruptions in the network, like electricity cuts, or transport being late, become part of the principals' challenges. The principals also need to attend to different stakeholders who visit the schools. It sometimes happens that more than one may visit the school at the same time, or the principal may be otherwise committed by the Department and is thus not able to attend to visitors for the project. Most of the rural schools had a problem with adjusting their timetables to accommodate the transmissions, but they succeeded in doing so. Only one school does not receive the grade 11 transmissions. For the rural schools, there are a lot of challenges with resources, although they benefitted hugely by receiving computers and IWBs financed by sponsorships. Some of them do not have laboratories, so this project actually relieved the problem, because the Science experiments can be shown on the IWBs. Every school would like to have more IWB classes, but some do not even have enough standard classrooms, or the classrooms are too small. Hardware and software are also limited. Limited technology resources, insufficient computers, limited technology use and hardware are mentioned as big challenges, the last of these including things like too few IWBs, scanners, copy machines and printers; computers needing upgrades; scanners, photocopiers, printers and data projectors broken; as well as stolen computers. The teachers are reporting several different challenges, but there were not many quotes associated with each challenge. Limited time for transmissions (only one hour at the beginning of a day for Mathematics, Science and Mathematics Literacy), and extra time spent to reteach lessons transmitted, if learners did not understand the transmissions, are seen as problematic. The difference between the programmes of the project and the Department was mentioned as a challenge by quite a few teachers, although the Department's pacesetter ought to be followed. Some teachers in the rural schools reported a challenge with increased workload, mainly as a result of more common assessments and marking. Another problem that arose was the necessity for some teachers to re-teach the learners after the transmission to ensure that everybody is on par, which also results in limited time to complete the syllabus, especially for the Grade 12s. Only two teachers mentioned inadequate training as having been a challenge, while one principal reckoned that there was limited professional development. Some teachers see the subjects involved as a limitation, being of the opinion that the project should involve more subjects, like Life Sciences, Accounting and Business Economics. The new Curriculum Assessment Policy Statements (CAPS) and the time involved to get through the syllabus are mentioned as challenges in the project. In Figure 3, the challenges of the leading school (LS) are shown. Some of the challenges are the same as those reported by the rural schools, but others can be seen as additional goals that they set for themselves. The fact that the programme of the project and the Department are not always commensurate is seen as a challenge by more than one interviewee, while the leading school believes that they just help the rural schools to follow the pacesetter of the Department. Although two interviewees reported that they also would like their schools to transmit lessons, the leading school believed that their teachers are much more experienced and should handle the transmissions. This is also reiterated by interviewees of some rural schools. The use of English as the language of communication is seen as a challenge by some teachers. The goals of the project are clear for everybody involved. A better pass rate, and specifically 100% Grade 12 pass rate, is the main goal of this project, coinciding with a higher standard of education, leading to bursaries obtained by learners of disadvantaged schools. All the interviewees in the leading school report an increased workload as a result of the preparations for the transmissions and the common tests. The e-learning office handles all the administration and yearly planning in quarterly meetings, where subject groups also meet with HODs. In the subject group meetings, peer teaching and coaching take place. It was a challenge for the administrative officer to get the marks reports from the rural schools in hand, but the leading school alleviated the problem by appointing someone from their own school to fetch the results. It is a challenge to find enough sponsorship to sustain the project, especially since there is no longer any monetary support from the Mpumalanga DoE. The leading school takes care of the technical support and most of the maintenance in the project. This consumes a lot of time and money, but according to the interviewees, this is taken care of very well. 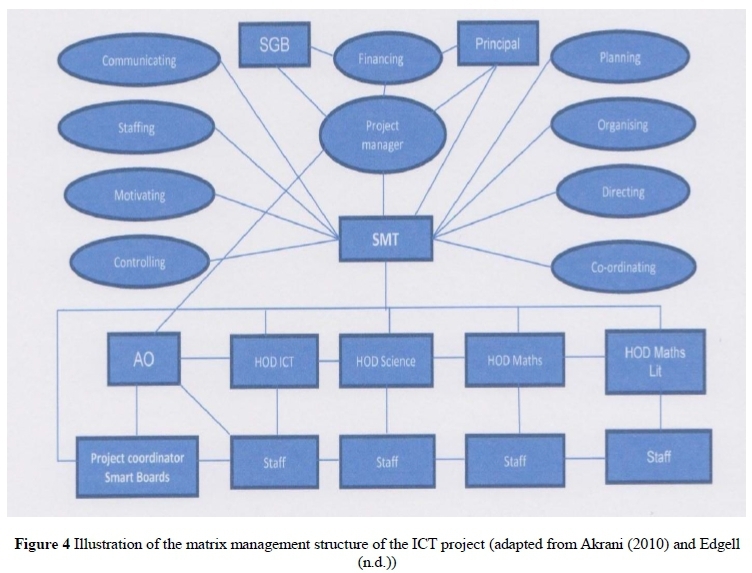 The Management Model and Approach in the Project Figure 4 illustrates the complexity of the management structure of the ICT project. Each school has its own internal management structure, with its own SGB and principal that need to take decisions pertaining to the financial implications of the project, while the project manager is responsible for the sponsors. The SMTs are in charge of the other management functions. Cutting across this is the ICT project that involves a number of schools, some with their own project coordinators, and an overall project manager in the leading school. This structure is typical of a balanced matrix structure, where all the teachers report to at least two managers - the functional (HOD) and the project manager and administrative officer in the leading school (project line). The principal of the leading school, who receives final reports from the project manager, is very knowledgeable about the project and is supporting and driving it. His buy-in is considered very important by everybody involved. This project is, however, the brainchild of the project manager. He sets his own goals and makes the overall decisions about everything. At the beginning of the project, he managed all the tasks, but now he has a project team to help him and the reports from the administrative officer, IT administrator and technicians go to him. His current role is to find sponsors and to give feedback to the sponsors. He handles the marketing of the project and, according to one teacher, is sometimes not available, as he is frequently out of the country. All the administrative reports in the project go to the administrative officer, as well as the reports of the teachers and HODs. All the results from common tests are sent to her before the meetings, so that she can analyse them and determine whether or not there is any improvement. She thus monitors the teachers' progress, ensures that everybody knows the schedules and receives their calendars, and handles any administrative complaints. According to the project manager, she plays a key role, and his words are moreover echoed by all the teachers. The HODs of the leading school, one of the teachers at the leading school, and one rural teacher (for Mathematics Literacy) handle the transmissions of the lessons. They formed subject groups for their subjects, and the teachers and HODs of the rural schools report to them in their subject groups. The teachers of the rural schools also report to their HODs who, in turn, report to their principals. According to the representative of the Mpumalanga DoE, this cannot be done by outsiders. In two rural schools, project coordinators have been appointed for the project, but the teachers do not report to them. These two individuals report to their principals, and are in charge of the equipment and ensuring that lesson transmissions happen on schedule. The rural principals are in charge of their own schools and play a very important role. The principals and SGBs are also in charge of the school budget. One of the principals mentioned that the SGBs are mainly in charge of things like the security and insurance of the equipment that they received from the sponsors. A provisional analysis of this project suggests that this initiative is an excellent model for other South African provinces to emulate, and that the project is extremely successful in bridging the urban-rural digital divide. The leading school's e-learning network uses 21st century technology to help disadvantaged schools to uplift their standard of teaching and learning and improve their results. Schools are likely to be much more effective if they are well managed. The project survived numerous challenges, but remained strong and has been growing over time. The hardware and software are in place and, although the project is vulnerable to electricity interruptions and other breakdowns, the human factor is much more unpredictable. Successful ICT projects are the exception, rather than the rule, and the fact that this one survived and thrived can mainly be attributed to good management. Each school retained its own management structure, but had to create the possibility of managing the ICT network across traditional boundaries. The on-going infusion of ICTs in schools has placed pressure on SMTs to address reform and make ICTs a priority in schools. In the leading school, the learning system can be judged by the state of the art equipment, with each class having an IWB, and teachers able to print learning materials from their classrooms. The disadvantaged schools received at least one IWB system, each through sponsor money and they are budgeting for more computers and IWBs. The subject that benefitted the most in the project was Science, as experiments became more accessible. Schools without laboratories benefitted most of all. Teachers need training in the most effective approaches to take advantage of the technology (NCTE, 2008), and it is an aspect that the leading school has undertaken to handle. The developing of high quality teaching materials is a significant addition to the workload of the teachers of the leading school and they have to improve the content and presentation of lessons constantly. There are different advantages in the matrix (Bobera, 2008). The project manager took over the full responsibility for the project management within the financial constraints imposed by the school budget and sponsor money. The project draws upon the expertise of teachers who are members of two different functional departments, namely Science and Maths. Thus, it is breaking down departmental barriers and allowing individuals to use their particular skills in the project (Riley, 2014). The teachers in the project set up their own goals and work schedules without being constantly supervised. This project is offering opportunities for professional growth. Management roles are defined properly and multiple reporting lines do not cause conflict, stress or confusion. The project can suffer if there is any doubt about the responsibilities of the functional and project managers, but it did not happen in this project. There were no problems that arose as a result of unclear job descriptions, personal conflicts between leaders, lack of trust between employees, insufficient communication between different teachers, ambiguous roles or confusion about who has the final authority (Sy & D'Annunzio, 2005). This study's value lies in its use of a type of matrix management model. Management is a set of well-known processes that keep an organisation going, like planning, staffing, organising, leading, problem-solving and controlling people, objectives and resources by means of human, financial and physical resources to fulfill the objectives of the organisation (Van der Westhuizen, 1995). In this project, the SMTs are responsible for all these processes. The management of this project closely resembles a balanced matrix, but is not exactly the same, as line reporting to HODs and principals remained active in the rural schools, although the matrix exists next to it. As with the balanced matrix, this is appropriate for dynamic, diverse, distributed and technically complex activities (Sy & D'Annunzio, 2005). Similar multi-school models will develop in the same way. We can expect that there will be an overall project manager from the leading school. There will be a steering committee in the leading school, with an administrative officer, Information Technology admin-istrator(s) and technicians. The project manager will report to the SGB (mainly giving feedback) and principal. In the rural schools, there will be a SGB in charge of the budget and the principal will share this responsibility. In each school, there should be a project coordinator, but this will not necessarily be a formal position; it may just be somebody responsible for the hardware or ensuring that the transmissions take place without any hassles. Horizontal reporting to the project manager and administrative officer will take place across schools and within the leading school. Vertical reporting takes place to the HODs as functional managers and to the principals.